like this in Anchorage, Alaska. 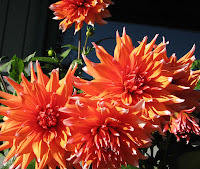 Dahlias are among the most popular of garden flowers, and among the most beautiful. (Just look at Lynch Creek Farm's website for evidence of that.) Almost everyone knows about dahlias, so having at hand a collection of odd and esoteric information about these treasures of the garden can reward you with the reputation of a great conversationalist. While dahlias were first found growing wild in Mexico, they are in fact plants that like temperate climates. 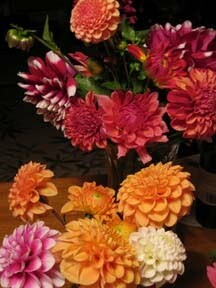 In fact, dahlias will grow well as far north as inland Alaska. Last year, Shiloh McCabe shared photos of her luscious dahlias grown in Anchorage, Alaska, and 370 miles farther north, Sonja Benson and her fellow dahlia lovers grow beautiful dahlias in Fairbanks, not all that far from the Arctic Circle. The several species of dahlias, classified as the genus Dahlia, are members of the family Asteraceae in the order Asterales. That's not hard to imagine, since they have a somewhat similar construction. But the order Asterales is part of the class Magnoliopsida, of the division Magnoliophyta. Magnolias? Nah. Magnolias are eventually classified in the same division and class, but at that level the terms just refer to flowering plants. dahlias regarded them as veggies. Want something a little less cerebral than plant classification? 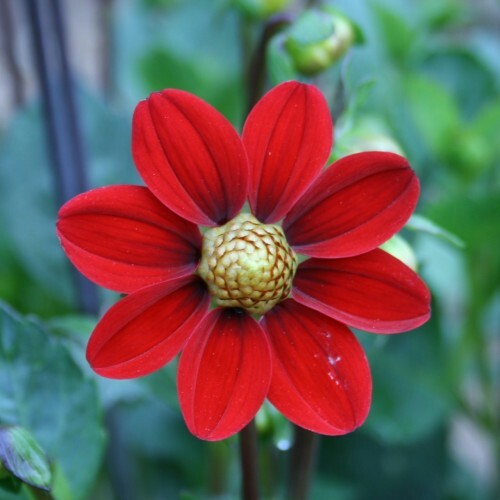 Consider the fact that the Swedish biologist Andreas Dahl, after whom the plant was named, regarded the dahlia as a vegetable rather than a flower to be grown for its beautiful dahlia blossoms. 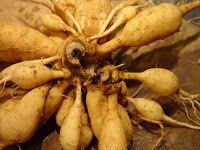 Yes, the tubers are more or less edible, and indigenous peoples of the Americas are said to have used dahlias for medicinal purposes, but once growers discovered the ease with which they could develop varieties of dahlias with stunning blooms, dahlias moved from the kitchen garden to the herbaceous borders of Europe's gardens. like this single, "Baby Red." Here are some more quirky bits about the history of dahlias: the first European to discover dahlias was a Spaniard, Francisco Hernandez, who was sent by King Philip in 1570 to study the plants of his new-world colony. In 1789, the director of the botanical garden in Mexico City sent dahlias to the Royal Gardens of Madrid, in Spain. It was a staff member there, Antonio Jose Cavarilles, who grew several species of the new plant and named the genus for the Swedish botanist, Dahl. And just to make the international history of the plant more complicated, the first person said to have brought dahlias to England from Spain was named Lady Holland. Labels: dahlia classification, dahlia facts, dahlia history, growing dahlias. Just Getting into Gardening? Grow Some Dahlias!